Be All That Someone Else Can Be. $637.721 thousand on 25 screens. As a great man once said, there's a thin line between clever and stupid. Few movies straddle that line as precariously as 1999's bizarre opus, Being John Malkovich. This film easily could have fallen into a morass of art school pretentions but miraculously, it somehow manages to create one of the more entertaining and compelling cinematic experiences I've seen in a while. Frankly, Being is such a clever and inventive film that my comments about it will be shorter than usual. (Pause to wait for the applause to fade.) I'm not abbreviating my usual rambling notes because I have nothing to say about the movie; on the contrary, there's plenty I'd love to discuss about it. However, too much of the fun of Being comes from its surprises. Granted, I'm sure I'll still enjoy the movie upon additional viewings, but I would have been peeved had I known many of its delights in advance. As such, I'll leave most of this space blank other than to relate a general description. Tortured and commercially-unsuccessful puppeteer Craig Schwartz (John Cusack) takes on a job as a file clerk and discovers an odd portal behind a cabinet. This doorway to another dimension actually leads the inhabitant inside the head of John Malkovich (John Malkovich) where for 15 minutes, that person can see the world through his eyes and feel his emotions. The film explores what happens from there and goes down quite a few paths I didn't anticipate. The movie features a lot more Malkovich than I'd expected; I thought he'd provide a cameo or two and that would be it, but he's honestly the lead actor. It's a shame he didn't get an Academy Award nod, because he does a fantastic job; he doesn't simply play himself, and his part ends up as easily the most demanding of the film. Being John Malkovich isn't a flawless or absolutely brilliant piece of work, but it's damned different and it's also very well-executed. That's a powerful combination that combines nicely in this case. 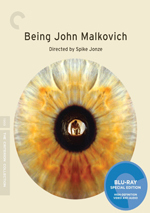 Being John Malkovich appears in an aspect ratio of approximately 1.85:1 on this Blu-ray Disc. I thought the Blu-ray delivered a strong replication of the film. Sharpness was quite good. A few interiors seemed a smidgen soft – as did the opening puppet show – but the majority of the flick offered nice clarity and accuracy. No issues with shimmering or jagged edges appeared, and I noticed no edge haloes or artifacts. The transfer seemed to lack any notable noise reduction – grain looked natural – and it also came free from print flaws. Colors were stylized but fine. Much of the movie came with a mild bluish tint, but that wasn’t overwhelming, and it suited the film’s odd unreality. Overall, the hues appeared well-rendered given their aims. Blacks were dark and tight, while low-light shots exhibited positive smoothness and delineation. Outside of a wee bit of softness, this was a top-notch image. I also felt satisfied with the film's DTS-HD MA 5.1 soundtrack. It provided a fairly broad and rich audio environment that presented effective information from all sides. This didn't seem to be the kind of project that would lend itself to a wide surround presentation, but the sound designers made the environment realistic and effective. The audio seemed well-placed and nicely localized, and it remained natural at all times; the gimmicks used were appropriate but not overdone, as the film accurately put us inside Malkovich’s head. The quality also seemed fine. Dialogue appeared natural and warm and was consistently intelligible. The music was pretty smooth and deep and displayed good dynamic range, while effects were clear and realistic. All in all, the audio complimented the film and provided better than expected material. How did the Blu-ray compare to the original DVD from 2000? Audio was broader and more engaging, with a smoother soundscape and more dynamic power. The DVD sounded good, but the Blu-ray was a notch superior. On the other hand, the visuals made a much more considerable jump, as the Blu-ray blew away the DVD in every possible way. The Blu-ray looked tighter, cleaner, and better realized. The DVD was quite ugly, so the Blu-ray became an impressive upgrade. The Criterion Blu-ray mixes old and new extras. We open with a selected-scene audio commentary from director Spike Jonzes’ friend/”competitor” Michel Gondry. 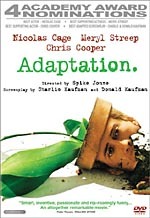 Accompanied by Gondry’s editor Jeff Buchanan, the disc’s text claims that this track was “originally recorded for the full duration of the feature” but the “commentary has been abridged for reasons of accuracy, audience interest and legal liability”. Is this true? Maybe, but probably not – given the tongue in cheek nature of so much related to Malkovich, I’d regard any notes of this sort with a grain of salt. In his 57-minute, 21-second track, Gondry discusses his relationship with Malkovich, thoughts about the film and its cast/crew, and other related subjects. Part-way through the flick, Gondry’s well starts to run dry and he gets Jonze on the phone. Thank God for that, as this choice semi-redeems an otherwise pretty spotty track. 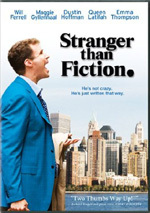 Gondry’s accent can make his commentaries tough sledding, and his tangential connection to the film doesn’t help, so the pre-Jonze parts aren’t very interesting. Once the director enters, the piece still doesn’t become great, but at least it turns more informative and enjoyable. Next comes a documentary called All Noncombatants Please Clear the Set. It goes for 33 minutes, 21 seconds as it provides footage from the set. This includes comments from Jonze, actors John Cusack and Catherine Keener, and a few unnamed crewmembers. The soundbites are essentially inconsequential, as “Clear” emphasizes behind the scenes footage from the set. That factor makes it moderately interesting, but it’s such a random mess of clips that it loses impact. While we get some interesting glimpses of the production, we never receive a particularly strong feel for what the movie’s creation was like. Given the tongue-in-cheek attitude that affects some of the movie’s bonus materials and Hodgman’s work as part of The Daily Show, I feared that the interview would nothing more than an extended attempt at laughs. However, we get a surprisingly serious chat here. We learn some good facts about the flick and find interesting opinions about the involved subjects. This becomes probably the disc’s best extra. A running collection of pictures pops up under Spike’s Photos. This spans 15 minutes, 29 seconds and shows Jonze’s images while he discusses them and the creation of the film. Since Jonze opens this feature with a declaration that it’s for the film’s 30th anniversary edition – and it’s now 2028 – I entered it with the same trepidation that greeted the Malkovich interview. However, it also exceeded those expectations, as Jonze mostly plays it straight. 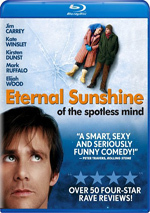 I don’t think the photos are that great, but Jonze’s commentary adds good insights. With that we shift to elements that also appeared on the original DVD. 7 ½ Floor Orientation (2:12) and American Arts & Culture Presents: John Horatio Malkovich, Dance of Despair and Disillusionment (4:17) both show elements that popped up in the body of the flick; here we get to see them on their own. As with the film itself, the less said about these, the better; to discuss them would be to reveal too much of the movie’s story. In any case, they're somewhat superfluous - we see virtually all they have to offer during the film itself - but make for nice additions nonetheless. An Intimate Portrait of the Art of Puppeteering provides a look at Phil Huber, the guy who manipulated all of the puppets in Being. This segment runs for seven minutes, 20 seconds and walks a very fine line between sincere tribute and barely-concealed mockery. It's cool to learn a little more detail about the techniques; I could have lived without the somewhat smarmy tone, though the piece probably isn't as nasty as it could have been. A few other supplements round out the collection. Spike's Photo Album provides 30 images of the cast and crew; they're pretty decent and deserve a look. We also find the theatrical trailer and four excellent TV spots; the best of the bunch is the one that treats the promo as if it were an ad for a cheesy self-help service. Finally, the set provides a 16-page Booklet. It features a goofy “interview” of Spike Jonze conducted by “wildcat pop culture critic Perkus Tooth” and some photos. It’s not one of Criterion’s more substantial booklets, but it’s interesting. Does the Criterion Blu-ray lack any of the old DVD’s extras? Yup – it drops a short featurette called “An Intimate Portrait of the Art of Background Driving” as well as some cast/crew biographies. Being John Malkovich isn't the best movie I've ever seen, but it's one of the most unusual, and it's also awfully compelling. The Blu-ray comes with very good picture and audio as well as a reasonably interesting set of supplements. The film’s too weird to be for everyone, but aficionados will feel pleased with this Blu-ray, as it’s by far the best home video release of the flick to date.